Hosting - Don't settle for shared, virtual, or even dedicated! We highly recommend switching from your old hosting provider to a Hosting Add-On plan with Webidextrous. Why? We have the industry’s fastest, most secure hosting setup. Not only is it high-performance and high-availability, but it’s much easier to manage than all the other hosting platforms. In fact, you, as a Webidextrous customer and website owner, won’t have to lift a finger to do any of the hosting setup or maintenance work. We can do all of that for you! Update sites knowing that all fixes and changes are able to be tested or staged independently from the main development code. If you have multiple developers, they can each have their own environments to work on that will “merge” into the development environment before being tested and going live. Secure your website with an HTTPS certificate to comply with Google’s latest security requirements for indexing and listing websites. Pantheon manages the HTTPS certificate for you at the click of a button. Every night and every week your site can be backed up. That includes databases, files, and code. Restoring a site is a simple click. Get ultra-fast page loads with Pantheon’s global Content Delivery Network (CDN), powered by Fastly. The CDN positions content geographically closer to individual users, reducing network response times and making your site fast enough for Google’s required page speeds. 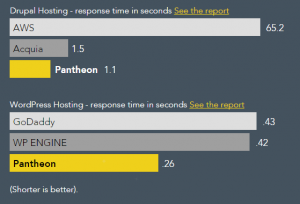 Need to move a site to Pantheon quickly and easily? Site migrations are automated and free. We’ll take care of all of that for you! If you get stuck with anything at all, Webidextrous is here to help you. You also get access to Pantheon-level chat support from real WordPress experts. Here is even more of a breakdown on what each plan includes. Click any of the tabs below for the technical details. Why host with Webidextrous when I can pay a few dollars a month* with some other host? Bottom Line: How much will it cost you in lost SEO ranking and revenue for a slow site? How much will you pay to recover from the inevitable security breach of your site that will occur with lesser-quality hosting companies? Wouldn’t you rather pay a little more now to ensure your site is the fastest and the most secure it can be? Clients who have budget constraints that require them to trade away security and performance for “just getting a site running” often go with cut-rate hosting companies such as GoDaddy, BlueHost, DreamHost, Wix, or SquareSpace. Several clients have switched to Webidextrous out of frustration when these popular hosting companies come up short. You’ll get reliable up-time with ALL our hosting packages. That means your website is always available to customers. Most hosting companies lure you by offering nearly free hosting, but then they put you on a “shared” server. Having your website on a shared server is sort of like living in an apartment building with a single “party” phone line for everyone to communicate on at the same time. When something goes wrong with one customer’s site, or if the “phone line” is compromised by a hacker or other disaster, it usually affects every “tenant” in some way. That means down-time, which means a significant amount of “missed” visitors and revenue over time. Even with the Webidextrous Basic hosting package, you’ll get a “single family home” plan. That means you get a dedicated container with a unique IP address. You also get better security than with shared hosting. When you add up the costs of lost revenues and hiring someone to re-do your website after it was altered or deleted by a hacker, you can consider the relatively small increase in investment as a form of insurance! All Webidextrous hosting packages include outstanding security. Containerized hosting is the first security measure all sites should implement. Determined hackers need more deterrence, which is why each plan offers Hypertext Transfer Protocol Secure (HTTPS) and Secure Sockets Layer (SSL). That’s what enables encrypted credit card transactions online. Not only is the transaction protected by encryption, but also the database where customer data is stored. And that’s with every hosting plan. Managing your own hosting, even with another host’s range of turn-key services, is tricky. Help with DNS glitches and site URL changes are among the most frequent requests we get from busy folks who just don’t have the time to figure it all out, or even hassle with support. With a Webidextrous hosting management package, you will never have to deal with any of that ever again. We do it all for you! *Cut-rate hosting companies offer super cheap plans that are usually only for the first month or the first renewal term. After that, you pay much more per month than the initial offer. Also, consider the time and opportunity cost of all the recovery work when (not if) your cut-rate host is compromised. Everybody offers secure hosting. How is this different? As a Pantheon.io Partner, we can provide more and better security than any other hosting company in the industry. Pantheon grants access according to least privilege. Employees can interact with servers via a secure API without actual server access—when they do need it, SSH-key based authentication is used and activity is recorded in a central log. Pantheon continually deploys new container host instances with the latest supported kernel, OS and packages. Containers are migrated to the updated instances automatically and the older systems are retired. Core CMS application updates and security patches are tested internally before being deployed to our customer base through our one-click update workflow. Security issues identified by Pantheon are immediately communicated to affected parties. Details of any significant disruption are posted status.getpantheon.com and tweeted by @pantheonstatus. We always conduct a post-incident review of security events to improve the effectiveness of our response to future incidents. Pantheon’s primary datacenter is managed by Rackspace. Rackspace provides 24/7 direct support access on any hardware issue. Access to data centers is granted though both keycard and biometric scanning protocols and protected by round-theclock surveillance monitoring. Every Rackspace data center employee undergoes thorough background security checks before hiring. Many of Pantheon’s core components are fully redundant and highly available with no single point of failure: the internal Pantheon API, the edge routing layer, DNS, and files directory storage. Where redundancy is not feasible, we maintain automated tools to facilitate recovery. Pantheon’s internal services are designed to tolerate process and server-level failure. We maintain a minimal server footprint in multiple datacenters to facilitate restoration in the event of a datacenter-level failure. When possible, we use redundant providers for upstream services like DNS. Pantheon uses industry-standard practices for on-disk storage, including writing to multiple physical disks with hardware-level RAID. For further protection, customers can make automated backups on the platform. Backups have over 99.99% durability and availability, are stored in multiple datacenters, and are encrypted at-rest. Backups can be automated or triggered manually. Each backup, containing all site-related customer data, is shipped to Amazon S3 as a compressed archive. Backups are encrypted during transfer and at-rest with 256-bit Advanced Encryption Standard ciphers, storing private keys and encrypted backup data on separate servers. Users have the ability to test restoration via the dashboard for any site for any manual or scheduled backup. They also have the ability to restore from a backup to a new site, on Pantheon or elsewhere. How is a container better than a shared, virtual, or dedicated server? Pantheon uses control groups, a kernel-level facility for resource isolation for memory, disk, cpu, and other server resources. This means that process and memory-level isolation are effective for all customer processes, from PHP to MySQL. Pantheon runs over a million checks a day to proactively monitor network, server, and application resources. Uptime data is always available at status.getpantheon.com. Update Drupal and WordPress core with a single click. Pantheon’s built-in dev, test, and live environments allow developers to push updates to production safely and quickly. Pantheon’s intrusion prevention system (IPS) adds a layer of protection, using a x.509-based public key infrastructure to add authentication and encryption to the Rackspace network. IPS runs for any service with user-chosen passwords— dashboard, SFTP, Git, Drush—detecting failed logins and preventing unauthorized host access. Pantheon works with Rackspace and CloudFlare to provide management of denial-of-service attacks, filtering ongoing attacks and isolating traffic streams through Riverbed load balancers for each site and environment. Pantheon supports SAML integration, enabling additional security features like two-factor authentication and single sign-on. Customers can also enforce settings like minimum password strengths or authentication audit logs. Pantheon’s Change Management feature allows site owners to manage organization-wide settings and selectively grant or deny developer access to deploy to production. Pantheon prevents malware installation by running a Linux OS. We use only established vendor repositories for software, verify software package signatures, perform cryptographic validation of platform code, and maintain auditable change management. ClamAV antivirus protection ensures our system’s integrity and to prevent malware from spreading through customer websites. Learn more about what developers can expect on our hosting platform.